How to Prevent Ice Dams from Forming on Easton, MA Roofing | Boss Services Inc.
Property owners in the northeastern states need to be aware of the common pitfalls that can occur during the winter season. One of the challenges we face is in preventing ice dams from forming on the roof. An ice dam is a large mass of ice that can form at the edge of a roof. It only forms under certain weather conditions, but it is quite common within the local region. 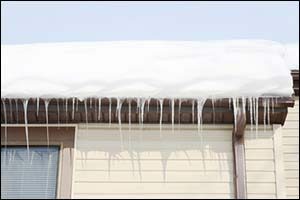 Ice dams can cause damage to the roof itself, as well as to gutters, downspouts and the inside of your home. It is important to work with a trusted Easton roofing contractor to find preventive solutions that you can count on during the winter season. Quick response to leaky roof repair in Easton, as well as roof system solutions going forward, can help you recover from damage caused by ice dams and prevent them from occurring again in the future. If you are looking for a professional Easton roofing company, look no further than BOSS Services, Inc.
Having an understanding of how something works can help you to find a better solution. An ice dam is formed when the roof over your attic becomes warm enough for the layer of snow closest to the shingles melts. The dripping water from the melt makes its way down between the still existing layer of snow and the warmed shingles all the way to the edge of the roof. In most cases, this area is the eaves, which stay colder than the rest of the roof due to the extension past the side of the house. Once the water reaches the edge of the roof it will usually freeze, causing a growing mound of ice to begin forming in the same spot. Higher pitched homes won’t usually have as much of a problem as homes with flatter pitches. Water can be trapped, allowing ice to form, inside of the gutters at the location of the eaves. Snow and ice begin to form there and, if it is allowed to build up high enough, can be another location for creating an ice dam. The amount of damage that can be caused by ice dams can be staggering. Each year, our team of Easton roofing contractors get called out to work on homes that experienced this winter phenomenon. Leaky roof repair in Easton can get expensive, especially if the melted water from the ice dam gets down into the ceiling and walls that are underneath the eaves. Insulation, sheet-rock, paint and other personal property can be damaged. In addition to damage to the interior of your home, a roof system solution is required to prevent ice dams from causing damage to the outside as well. Our Easton roofing company can help you find solutions to prevent damage, such as broken shingles, gutters and the things that these exterior parts can fall on, including cars, shrubs, window sills and other parts of your home. In fact, pets and people have also become victims of ice dams, making it a serious safety risk. Even if you have never experienced an ice dam, it is important to consult with an Easton roofing contractor to make sure you do everything you can to prevent one from forming. Over the years, we have seen a lot of attempts by homeowners to prevent ice dams from forming. Some work better than others. Unfortunately, some of these methods have caused other types of damage, requiring our team of Easton roofing contractors to come out and make repairs, replacements and even put on brand new roofing in some instances. Leaky roof repair in Easton and the surrounding area can be avoided just by working with a pro from the beginning to find a roof system solution that works. The fourth solution is also the best possible cure for ice dams. In fact, your Easton roofing company can help you install this roof system solution, avoiding costly repairs and dangerous preventive measures. Electric roof de-icer cables can be installed by your Easton roofing contractor. They are affordable and provide the perfect solution to this common problem for northeastern home and property owners. While there are do-it-yourself kits available on the market, it is important to have de-icing cables installed by an experienced contractor for best results. If you are in-need of an Easton roofing contractor or need other repair, remodel, renovation and installation services for roofing, additions, kitchens and bathrooms, decks, siding, windows and doors, basement remodeling, flooring, painting and much more, contact BOSS Services, Inc. by calling 508-297-0635. Our licensed and experienced contractors will come to your property and provide you with a FREE estimate for our services. Call today and get your roof prepared for the coming winter season.